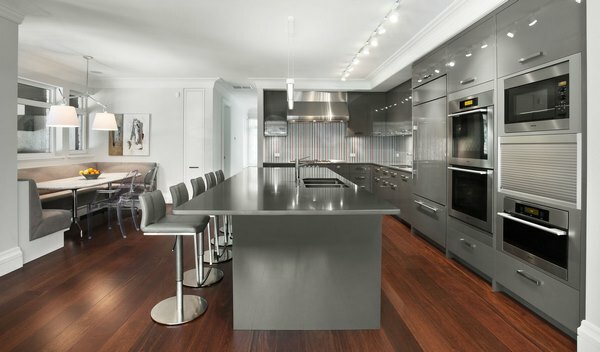 Gray kitchen interior design is based on creative planning solutions and exceptional aesthetics. 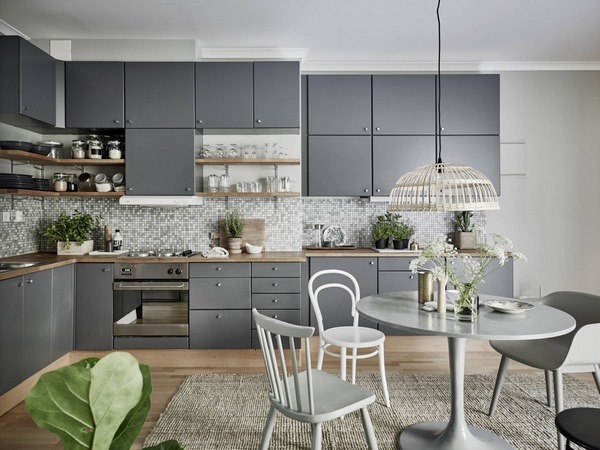 Competent choice of color schemes and combinations of colors where gray is dominant results in original and ergonomic designs of modern kitchen space. 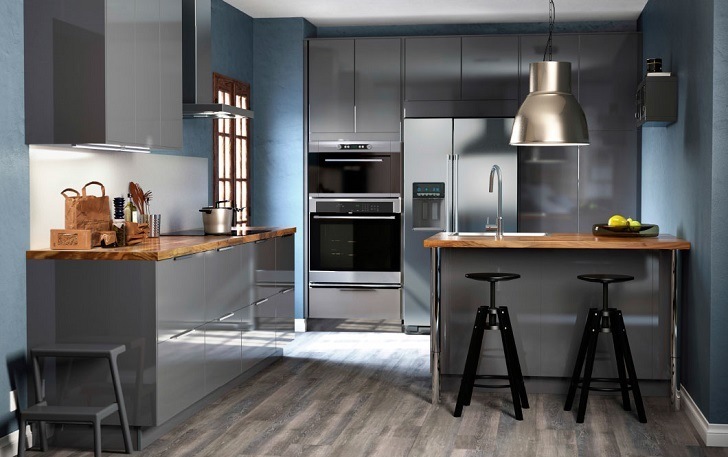 When choosing the right colors for decorating a room for cooking and dining, gray is beyond competition! 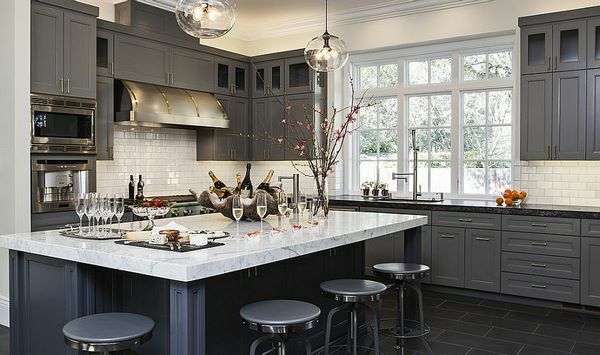 Gray, as a mixture of black and white, looks great in the interiors of kitchens in different styles. This color is universal and calm and a kitchen interior in this color creates a feeling of tranquility. To many people the color is a symbol of sadness and boredom, of cloudy sky and they avoid using it in home interiors. When working with gray, several factors should be considered: the laws of color, the size of rooms and their location, the scheme of lighting. 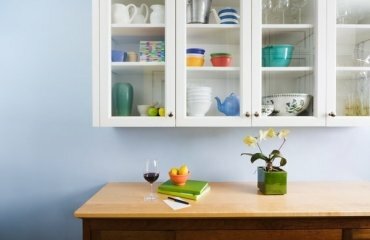 Creativity and a successful combination of this color with other colors, adding a few bold strokes will allow you create a unique kitchen design and transform a dull space into a modern and functional area. 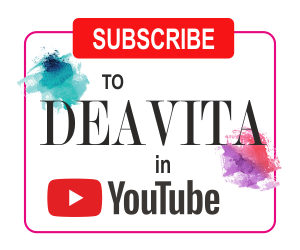 We shall look at the advantages and disadvantages of the color, how it combines with other colors and at the different ways to introduce a variety of shades in the kitchen so that the interior is harmonious and pleasing to the eye. Gray kitchen interior design – what is important to know? 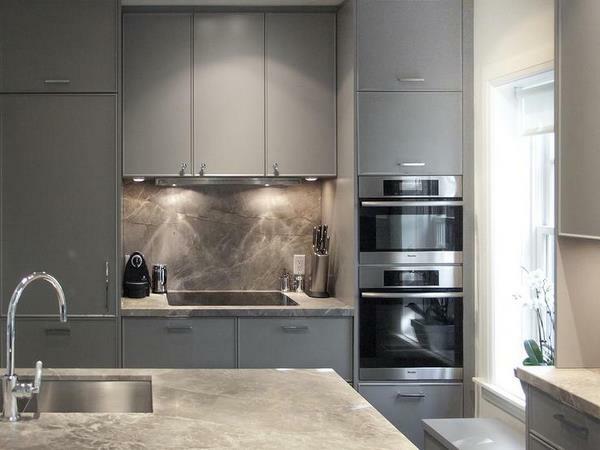 Gray kitchen interior design ideas look impressive but there is some really good knowledge involved when working with this color. The color can be tricky, it has numerous shades which can be either warm or cold. Kitchen interiors can be exceptionally elegant and an experienced designer can use the color as a starting point for many creative design ideas. 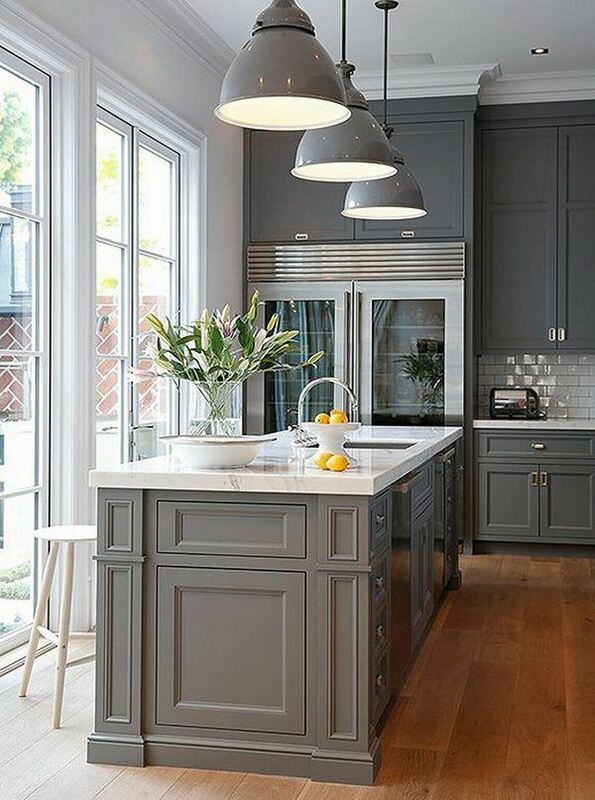 Considering the light is one of the first rules when you choose a kitchen in gray shades. Consider the location of the kitchen, if the windows are facing north, then choose a light shade. 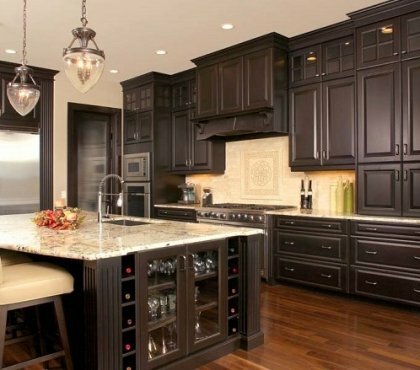 If your kitchen is facing south and natural light is abundant, you can safely choose a darker shade. Keep in mind that darker shades like anthracite, charcoal, lead, slate, graphite, etc. need a lot of light. Another important consideration when working with this color is the size of the room. Spacious rooms provide more design options in terms of choosing the saturation of the shades. 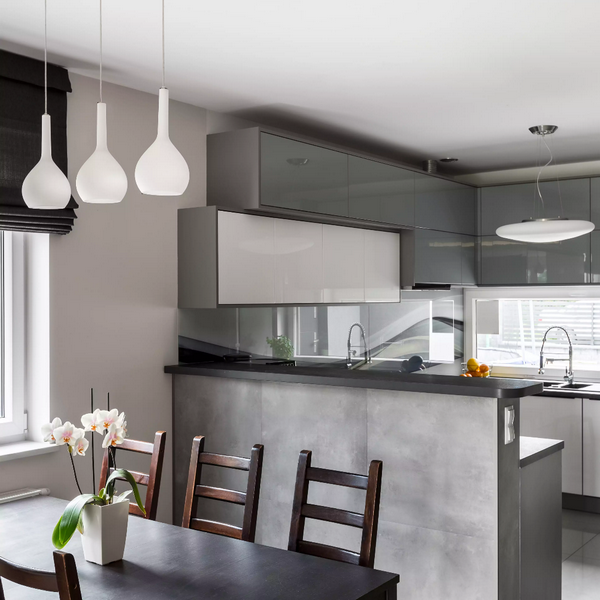 For a small kitchen in gray tones you need to visually expand the space so when decorating its interior, try to use light shades and combinations with unobtrusive colors colors like blue, beige, green and white. 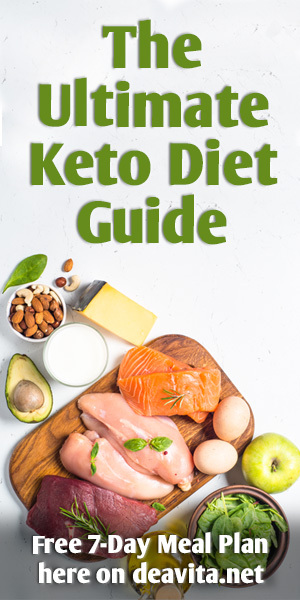 We shall look at the different color combinations that work harmoniously, but the general rule is that warm colors like yellow, brown, orange, etc. allow you to change the degree of cold and warmth, depending on the aesthetic taste of the homeowner and the designer’s concept. 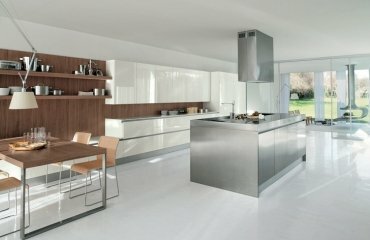 Why choose gray kitchen interior design? On the first place, gray is classified as a neutral color and like every neutral shade, it is the perfect background for bright color accents. In addition, it is not just a background, it is the ideal way to emphasizes the visual interest and depth of the companion colors. It also emphasizes the aesthetics of natural materials and balances the appearance of massive and bulky pieces of furniture. Practicality is another great advantage. 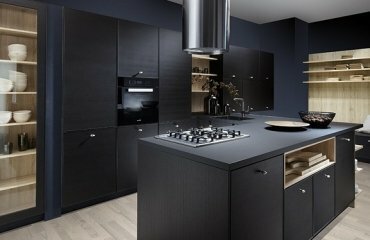 Is softens the appearance of contrasting black and white and a kitchen in gray is more unpretentious as far as maintenance in concerned. 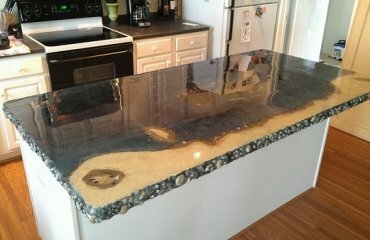 For example, fingerprints on matte furniture facades and traces of splashing water on the kitchen countertop are less visible. This color is universal and can be combined with any other color, which is one of the main reasons for its huge popularity in the design of not only kitchens, but also living rooms, bedrooms, and even home offices. Gray creates a calm, comfortable, harmonious environment. It does not steal the attention and is the best color for a place where you need to feel relaxed after a hard day. 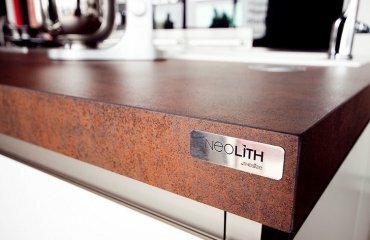 It can help you correct minor irregularities in the kitchen – visually increase or decrease the height, width of the walls, it can emphasizes the uniqueness of the design of kitchen accessories or the geometric shape of furniture. 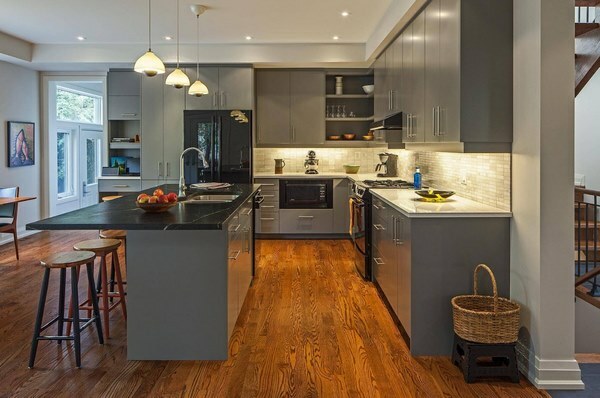 Spectacular gray kitchen interior design ideas – how to use the color creatively? 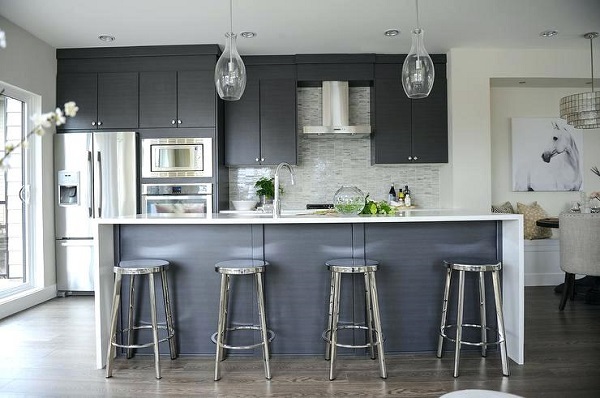 We have selected some of the most spectacular gray kitchen interior design ideas and you will see some great ways how to introduce and incorporate these shades in your home. Walls – there are quite many options as homeowners can choose between paint, wallpaper with or without pattern and depending on the overall design concept for the home, unplastered concrete walls are also a creative way to use the color as a main one. Those who are afraid of dominant gray in the kitchen can opt for an accent wall. 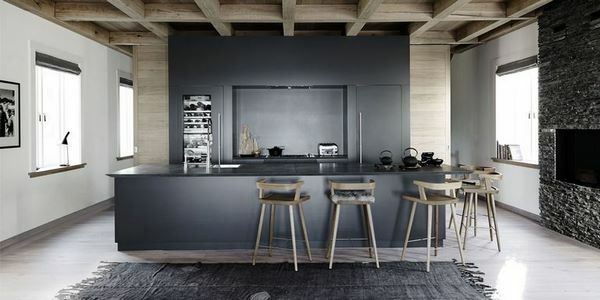 Floor – Dark gray floor is a good option when combined with light walls to visually increase the volume of the room. The choice of materials is quite wide – from natural stone, granite and slate to parquet, laminate, linoleum and tile. Many designers use the flooring material as an instrument for zoning the room so you can choose different shades or even different materials. For kitchen interiors with gray flooring, it is recommended to choose white (or very light shade) for the walls. Kitchen cabinets – The color of the kitchen cabinets sets the entire appearance of the room. Having in mind that they are the most visible element in t room, they will create the mood, atmosphere and character of the entire interior. 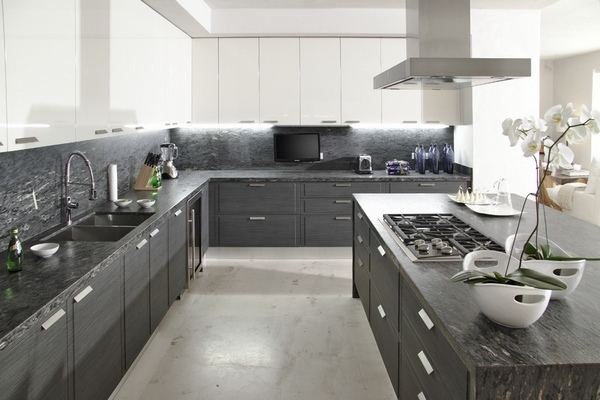 Manufacturers offer an amazing selection of cabinets with glossy and matte facades. Modern sets with glossy facades are complemented by aluminum, steel and chrome elements while matte facades are more often the choice for traditional styled interiors. It is better to choose stainless steel appliances as they complement gray cabinets much better than standard white ones. Very often cabinets are chosen as a part of dual tone kitchens where the uppers are white or in a light shade which makes the kitchen visually taller. Another option to introduce gray in your kitchen design is to use this color for the kitchen island as a contrast to white cabinetry. In this way the kitchen island will stand out and become a focal point. 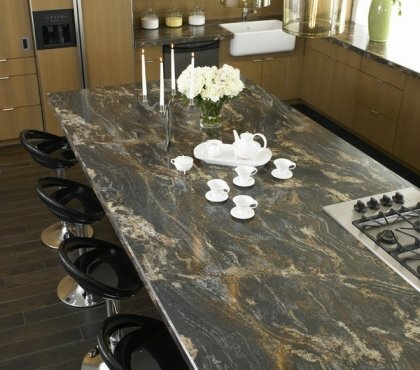 Backsplash and countertops – countertops can be found in a variety of materials – from natural stone, artificial stone to laminate. 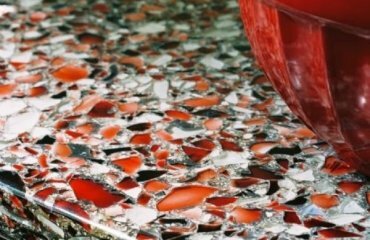 As far as backsplash is concerned, the choice is unlimited as gray tiles come in numerous shades and sizes and those who prefer a modern and sleek appearance can choose a glass backsplash with or without print. 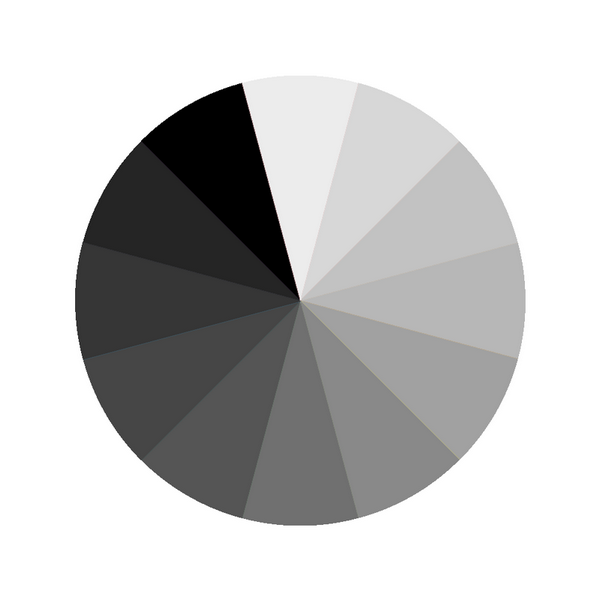 How to combine gray with other colors to create a harmonious interior? In the large selection of photos you will see many interesting and original ideas in a variety of design styles. 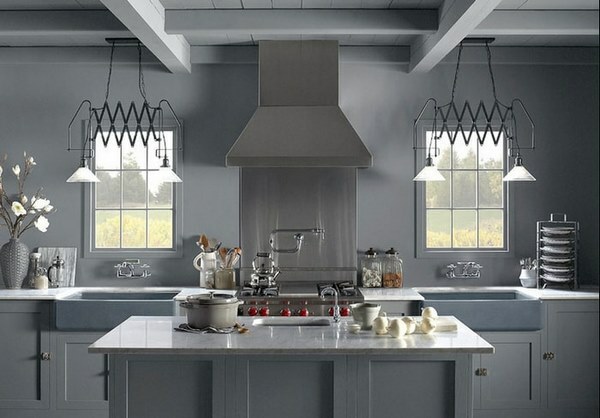 Monochromatic kitchens are designed in several shades of gray without additional colors. Typically, to avoid a monotonous appearance and make the interior more dynamic and expressive, designers use different textures and textiles, solid wood furniture and different finishes. 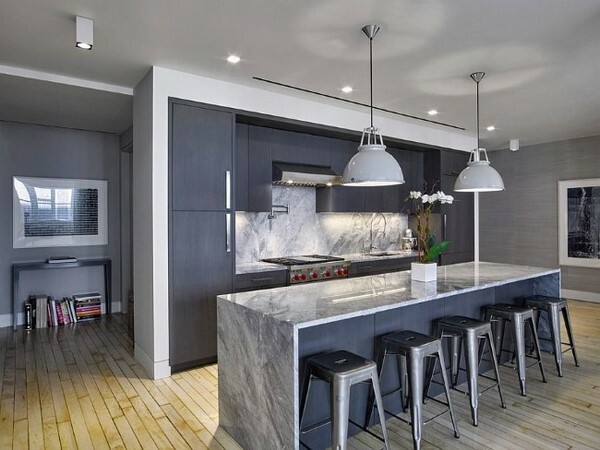 Gray and white is perhaps, the most popular combination in kitchen interior design and this is a win-win choice for a color scheme. Usually, kitchens are designed with white walls and gray cabinets or vice versa. A gray-white kitchen looks elegant and classy and different materials and textures add character and individuality. 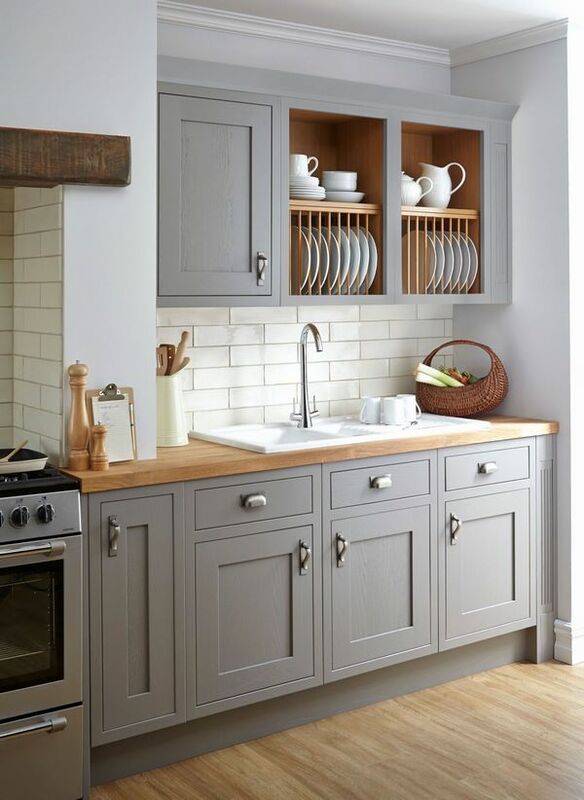 Gray and beige is a fantastic combination for kitchen interiors. Soft beige shades create very special atmosphere of coziness and the gray looks more pleasant and softer. Gray and brown kitchens interiors can be not only elegant, but amazingly sophisticated and noble. They have a special atmosphere of respectability and solidity. 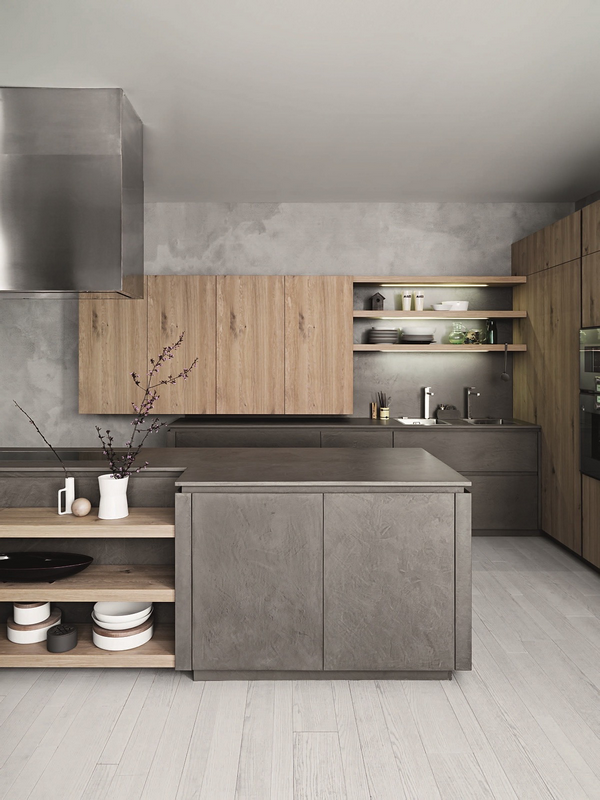 Brown can be introduced into the kitchen by furniture pieces, natural wood, textiles and decorative elements. 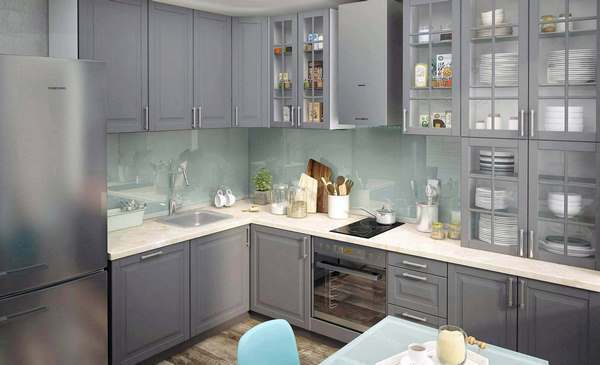 Gray and blue kitchen designs should be created with extra caution and attention when selecting the exact shades of both colors to avoid a cold and strict atmosphere. Choose warm brown shades, furniture and trim elements made of natural wood. 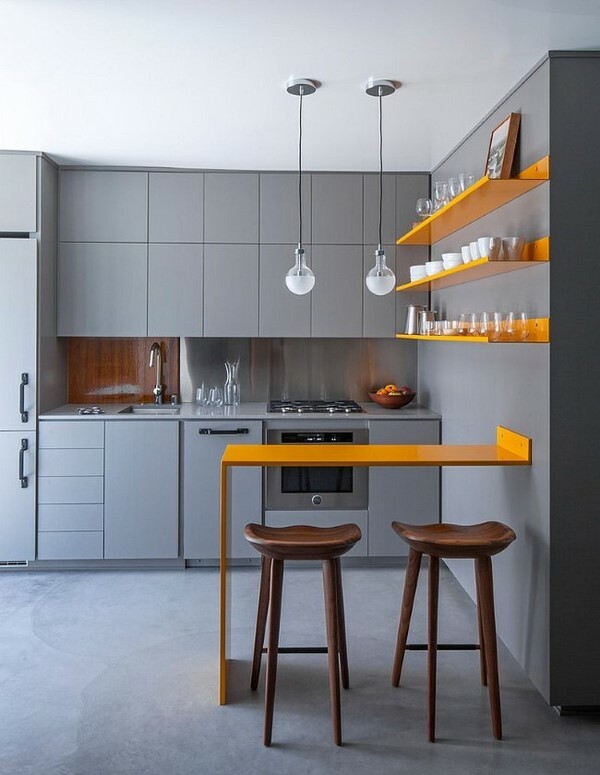 Gray and yellow or orange kitchens are very cheerful and visually pleasing. Such interiors look lighter and more spacious due to the fact that both orange and yellow are warm colors. Neutral shades balance the gray-yellow (orange) combinations and stainless steel appliances add a modern sheen. Gray and red kitchen design can be very successful if you chose the right shades. Burgundy works in an excellent way with dark shades like graphite or asphalt. Bright red is a good choice as an accent color as it stands out beautifully against gray background. Gray and purple color scheme provides opportunities for many visually interesting designs. Purple shades vary from pink to violet and lilac and can add tenderness, elegance and a feminine touch to a the kitchen. Colors are a powerful designers’ tool and with their help they create amazing home interiors. 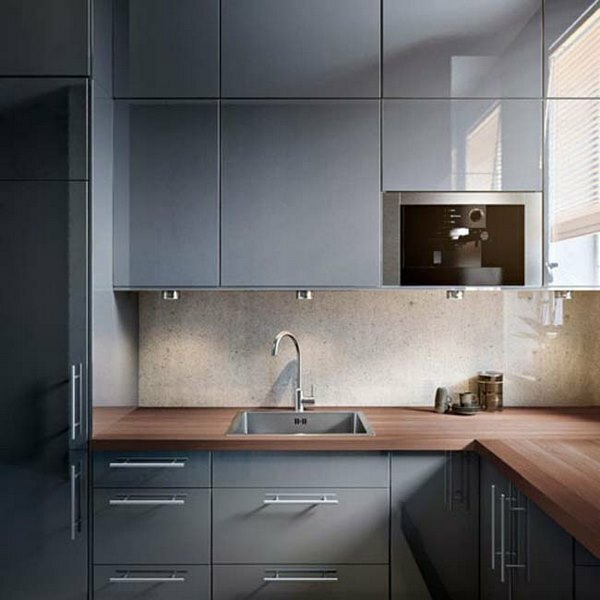 When we talk about gray kitchen interior design ideas, it is generally accepted to combine gray with soft tones or bright colors. The first group includes: white, cream, beige, pastel and light brown shades, imitating the color of natural wood. The second group includes all the colors of the rainbow: red, blue, yellow, green and others. 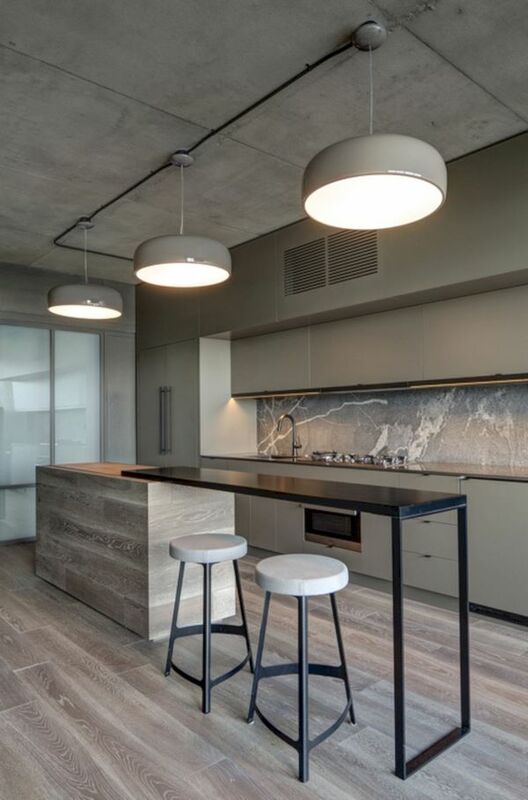 Look at the photos in the gallery below, enjoy these magnificent interiors and perhaps you will find your dream kitchen!